Recent polls report that 96 percent of Americans believe in God, and 73 percent believe that angels regularly visit Earth. Why is this? Why, despite the rise of science, technology, and secular education, are people turning to religion in greater numbers than ever before? Why do people believe in God at all? These provocative questions lie at the heart of How We Believe, an illuminating study of God, faith, and religion. Bestselling author Michael Shermer offers fresh and often startling insights into age-old questions, including how and why humans put their faith in a higher power, even in the face of scientific skepticism. 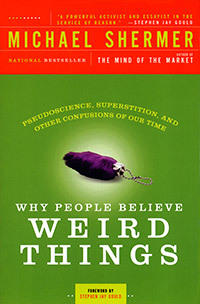 Shermer has updated the book to explore the latest research and theories of psychiatrists, neuroscientists, epidemiologists, and philosophers, as well as the role of faith in our increasingly diverse modern world. Whether believers or nonbelievers, we are all driven by the need to understand the universe and our place in it. How We Believe is a brilliant scientific tour of this ancient and mysterious desire. In How We Believe, Michael Shermer offers a different perspective on the God question, presenting a challenge to thoughtful believers who already understand the undeniable human element in the creation of religion.